Unlike muscle and sports cars, hybrids aren’t exactly screaming for aftermarket accessories. But, as hybrids mainstream, their dedicated enthusiast base is growing fast. And, the aftermarket manufacturers are rising to meet their needs. 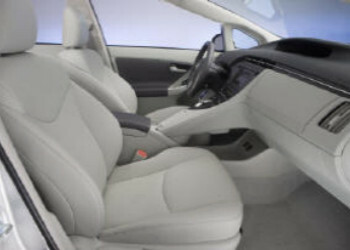 Right now the aftermarket is dominated by safety and protection products like bug deflectors, dash covers and car mats. But as demand grows, we’ll see performance products hitting the hybrid scene, too. But, the average hybrid hero still has a great selection of accessories to choose from. Since the majority of hybrids are built on the platform of an existing vehicle (we know, Prius owner, we know), accessories for the gas version usually fit their hybrid siblings. Patterned products like seat covers, floor mats and car sun shades are the easiest to find. Though they directly benefit from it, birds, trees and the elements don’t care about your efforts drive green—which is why they won’t hesitate to squeeze, drop and rain all over your hybrid. But with a car cover, you can easily thwart the very nature you’re trying to save. Unlike their EV cousins, hybrids boast unlimited range which makes ‘em great for road trips. And, to free up elbow room for your passengers, take your storage skyward with one of the custom roof racks made just for your hybrid. Now you can see the countryside without spoiling it.